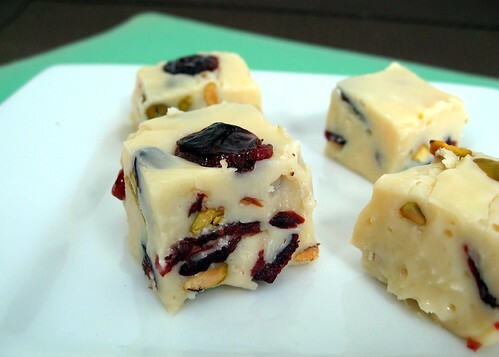 White Chocolate, Cranberry, and Pistachio Fudge – Elly Says Opa! When it comes to things like baking treats to give away or making meals for a large group of people, I planplanplan. I also change my mind about 150 times, which makes the planning that much more intense (and difficult, I suppose). I made a preliminary list of things I wanted to put in treat bags this year and was pretty proud of how quickly it came together. Everything was well-rounded in terms of mixing flavors, textures, things with nuts vs. things without, etc. But then I started over-thinking and over-planning, which led to changing the list…well, 150 times. I already mentioned that one peppermint chocolate cookie got swapped out for another. Well, so did a biscotti. I had originally planned on making pistachio-cranberry-white chocolate biscotti because I love the flavors and it’s so festive for the holidays, but when I later decided to make savory biscotti, I didn’t want to do a sweet version, too. Then I thought about using the same flavors with bark, but didn’t really feel like the possibility of my white chocolate seizing on me the instant I added extract. And, well, that is the train of thought down the rocky tracks of my holiday treat planning process that led to this white chocolate-pistachio-cranberry fudge. The colors are perfect for Christmas, the fudge is ridiculously easy to make, and of course it tastes great and incredibly rich, just like fudge should. I hope all of my Christmas-celebrating readers have a wonderful Christmas! Line an 8″ square baking dish with parchment or foil. Add all but about 2 Tbsp. each of the cranberries and pistachios to the white chocolate mixture, stirring to combine. Spread the mixture into the baking dish in an even layer. Top with the remaining pistachios and cranberries, pressing them in slightly with a spatula if necessary. Allow fudge to set (I do so in the fridge) and then cut into 1 or 1.5″ squares. *I used 14 oz. because it’s what I had leftover from a different recipe. I’ve made white chocolate fudge in the past with one pound, though, so feel free to use a pound so you don’t have to measure.